With offices around the globe, Kraken’s trading platform is now and again rated as (one of) the best and most secure exchanges for digital assets by independent media. Based on the euro volume, liquidity, and the trading of Canadian dollars, British pounds, US dollars and Japanese yen, Kraken exchange is the largest bitcoin exchange. When it first arrived on international scene in July 2011, they were the first bitcoin exchange displayed in the Bloomberg Terminal. 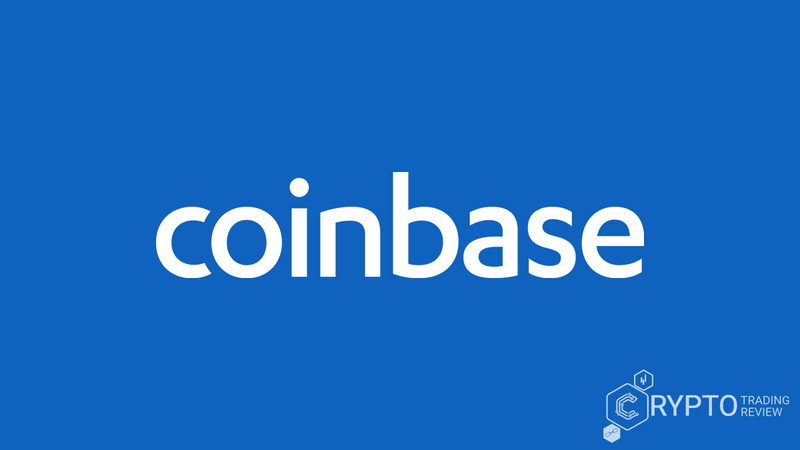 It wasn’t long until it was also the first exchange to pass a special kind of audit: in 2014, the company passed a cryptographically verifiable “proof-of-reserves” audit, meaning total amount of bitcoins held by the exchange was more than enough to cover their customers’ balance. The audit process itself is described in detail on the exchange’s webpage, with notes on how future audits will consider assets other than bitcoin. This is an important step in proving bitcoin’s solvency and Kraken was the first exchange to go for it. It was also the first exchange to offer leveraged margin trading. A Tokyo government’s court-approved trustee, as well as Germany’s BaFin regulated Fidor Bank, Kraken’s recognitions list is pretty long. That’s all well and good, but it is still one of the many bitcoin exchanges on the market, and the question remains – is Kraken any good? So, you must have come across a number of reviews, some better than others, hoping for some honest, hard facts on Kraken bitcoin exchange. Maybe you considered reading those less ‘official-looking’ user experience stories on forums and the like, bearing in mind that a lot of the reviews available on the internet are paid ads. You definitely skimmed the official webpage, but hey, those never talk about the potential drawbacks, don’t they? All things considered, we assume you are now facing a situation that comes with researching any service or product – mixed reviews at best. If this is not the case, and you’ve turned to our review first, great, we hope we will be able to save you some time and provide relevant information. If you already did your homework, we hope the following text will help you make sense of all those opinions you’ve gathered so far and make an informed decision. We’ll start with some basic information on Kraken bitcoin exchange and a detailed tutorial on how to use it, before going into more detailed analysis on Kraken fees, security, support etc. If this is still something that would require a lot of your time, feel free to skip to the last part, where we have summed up the most relevant pros and cons related to Kraken exchange. Yes, history. Headquartered in San Francisco, Kraken Digital Asset Exchange (we have to use the full name somewhere in here) is one of the oldest bitcoin exchanges, with the widest selection of digital assets and fiat currencies. It was founded in 2011 by Jesse Powell, a philosophy major, after his trip to Tokyo, where he was on his way to help Mt. Gox (then the world’s largest bitcoin exchange) recover from a big hacking attack. After two weeks of volunteering at a very poorly run exchange, this industry veteran decided to focus his expertise in another venture. He decided to build his own, truly professional bitcoin exchange. Powell was looking for a name that would signal everything he hoped this exchange would be – powerful, agile, robust, intelligent and secure – and found one in a mythological sea monster. So, there you have it, the how and why Kraken came about. And its reputation lived up to its name: Kraken has so far had an exemplary record, with proven operating history, and zero breaches by hackers. With a team of experienced technologists and traders doing the work, it’s no wonder this one is among the most popular exchanges in the world. We’ll get more into that in the following parts of our Kraken review, so don’t go anywhere. 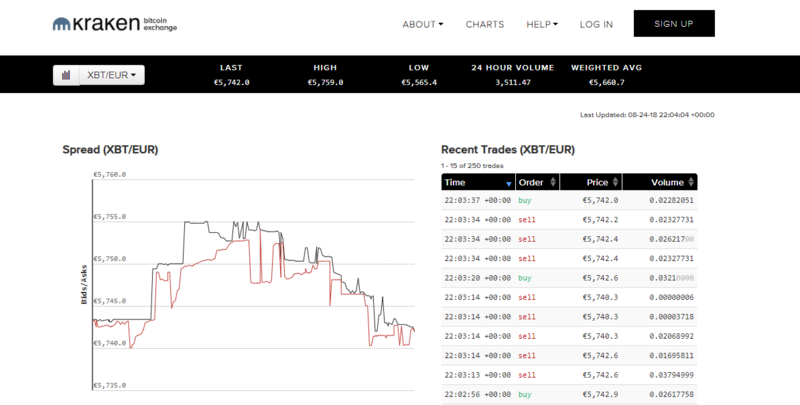 Kraken is a top global bitcoin exchange that supports Europe, United States, Canada and Japan. With average daily volume around 11 million euros, it offers excellent liquidity – this is great news for those of you looking to buy larger amounts of bitcoin. Offering a variety of bitcoin-fiat pairs (USD, GBP, EUR, JPY…), as well as some crypto-crypto pairs – Litecoin and Dogecoin, Kraken exchange is a trusted choice for hundreds of traders across the globe. Another option is margin trading – basically, Kraken offers you the ability to leverage your account balance on some specific trading pair or pairs. The exchange is very internationally accessible, which puts Kraken at the top of the list for many international users. In terms of trading, Kraken serves as both a currency exchange (exchanging one currency for another) and a Forex type market (trading currency pairs). The first option requires having adequate funds in one currency in order to exchange them for another. And while borrowing funds isn’t an option in exchange, in currency pair trading you always open with borrowed funds (using leverage). If you want to open a short position you must use leverage, since trading short is possible exclusively with currency pairs. Regarding order options, the website offers a wide range, as well as a high level of flexibility, both for exchanging currency and trading currency pairs. The exchange plans to implement the so called ‘kill or fill’ option, but your orders are, at least for now, able to be partially filled. If you visit their official web, you’ll come across a list of Kraken coins and currencies available for exchange (you may want to keep in mind that not all of them are available for either currency exchange or for trading on margin). With Kraken Exchange, you can buy and sell fifteen different cryptocurrencies, as well as execute margin trades. Although it’s probably famous mostly for Ethereum- and Bitcoin-to-cash markets (euros and dollars), you can also trade altcoins, such as EOS, Litecoin, Dash, Ripple, Monero, Zcash, Dogecoin, Gnosis etc. It is also among the rare exchanges offering Bitcoin against currencies like GPB and CAD. Before going into more detail on accounts, verification and Kraken fees, we’ll cover some ground regarding Kraken security – a topic that should be on top of your list of interests if you’re investigating a new trading partner. Operated by San Francisco’s Payward Inc., Kraken meets the Know Your Customer (KYC), as well as Anti-Money Laundering (AML) requirements from US regulators. So far, Kraken exchange hasn’t experienced any major hacking attacks, and it has a reputation for being completely safe. The company has a two-factor authentication and PGP/GPG encryption, which translates into a high degree of security. This option is available both on account login and in the trading and funding processes. You can share the Pretty Good Privacy (PGP) public key, so the exchange can use it to add more security when sending you e-mails. A master key and a global settings lock further ensure user security. 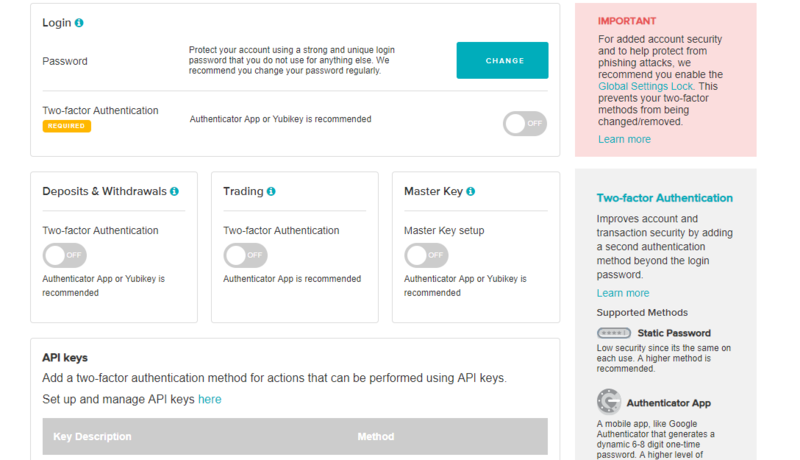 You can set up a master key for password recovery (including a two-factor authentication bypass), and the global settings lock is here to prevent tampering with your account information even in the (unlikely) event of an attack. The master key option is especially useful when switching devices and/or changing passwords. There are two things about your master key we must mention in this Kraken review: first, you need to store it separate from the rest of your credentials, and it comes in several forms (Yubikey password, classic password, Google authentication or a public/private key pair). It also incorporates cold storage techniques to secure funds. This means that Kraken holds most of funds offline (in cold storage), and their servers have a security system of their own. Security is especially important for the company – after the Mt. Gox collapse, it was the first company to create ‘proof-of-reserves’ that was cryptographically verifiable and is leading the way in cryptographically-verified auditing. In plain English, those regularly prove that the exchange holds 100% of its customer’s funds. A word of caution: while Kraken Exchange does provide you with a public address for depositing coins to accounts, the company holds the private key to the public address. Although this has never posed a problem, it’s worth noting that Kraken is aware of the trust given to it by its users and acts accordingly by providing all the security it can. On to some explicit instruction, now that we’ve covered the security aspect of trading here. In the following part of our Kraken review, we’ll explain the basics of working with Kraken’s accounts, and then move onto an in-depth analysis of the different types (or tiers) of accounts the exchange offers. First, let’s see how you can sign up for an account on Kraken. Singing up for an account is basically the same on most online platforms. In short, you’ll need to provide your name, e-mail address and a password (at least 8 characters long, containing letters, numbers and special characters). You open an account by simply following the signup process, but there is still some specific information we would like to share at this point. Kraken offers basic and advanced accounts, and those two differ in their verification process. For the basic one, you will be required to give your full name, date of birth, address and phone number. However, those of you who want to open an advanced account have a somewhat more to do. Don’t worry, we’re on the case. First, you need to upload your ID – any government issued form of identification and proof of residence. This is done through the ‘Get Verified’ tab and the verification time lasts from a few days up to a week, depending on the number of applications being processed. (We’ll cover the details on the various verification levels later.) The basic accounts are activated by copy-pasting the activation key received via e-mail, and the whole process in done in minutes. Before funding your account, make sure you don’t forget to add that 2FA and add a layer of security. The second step involves adding the bank account that you’ll make transfers from and to. At this point, you need to know that for depositing funds, bank transfers and wires are the only accepted methods. Fiat deposits and withdrawals can be completed through Swift, SEPA and bank wires. US users are charged 5$ for using bank wire, while transfers outside US cost 10 dollars, euros or pounds. In Canada, Canadian dollars (CAD) are wired at no cost, while funds are transferred free in the European area using SEPA wire transfer. Japanese users are free of charge if they deposit and withdraw any amount below 5000 yen. In order to deposit funds, you need to navigate to the ‘Funding’ section in your account’s Menu tab and choose your preferred deposit method. Besides deposits via bank transfer, you can use a cryptocurrency wallet to transfer funds to your account. Once you’re funded, you’re free to do some trading – just click on the ‘Trade’ tab in the same Menu and select ‘New Order’. After selecting your currencies (the one you want to buy and the one you’re paying in), the quantity and a market or a limit order, just click on the green confirmation button and your purchase is confirmed. So now our Kraken review has covered the basics, but you won’t get very far with those once you realise there are a number of them – not only rules, but accounts as well. Luckily, this review includes a comprehensive guide in which we made sure you have all the information you need for successful trading with this cryptocurrency exchange. This first level offers neither deposits, withdrawal nor trading options, but you can access price statistics and trading charts. Basically, this tier allows you to navigate and explore the site before upgrading to Tier 1. With a Tier 1 account, users can deposit and withdraw cryptocurrencies and trade in cryptocurrencies and fiat currencies. There are no daily or monthly deposit limits; however, there are withdrawal limits – those are limited to $2,500 a day and $20,000 a month. It’s important to note that while Tier 1 allows you to trade between different cryptocurrencies, it does not allow trading between fiat and cryptocurrencies. So, how do you get to Tier 1? You are required to update your profile, meaning you need to input your full name, date of birth, country of residence and telephone number. Verification can last one to three days, possibly longer for users outside Europe, North America and Japan. Now, getting a Tier 2 account makes things interesting. After verifying this one, you are eligible for daily fiat deposits and withdrawals of up to $2,000 and $10,000 monthly. Cryptocurrency limits related to this tier go up even more – you can now withdraw $5,000 daily and up to $50,000 a month. As you already noticed, Tier 2 is the minimum tier you have to have in order to buy cryptocurrencies such as Ripple. Regarding qualification for this particular tier, there is one more bit of information you need to share with the exchange, and that’s your post address. Again, approval may take several days. Tier 2 allows deposits, withdrawals and trading in digital currencies, but fiat funding depends on your country of residence. For example, bank deposits and withdrawals are made available after providing Kraken Exchange with your address. Tier 3 is an account created for more serious traders. With its sizeable volumes, it should cover all of your trader needs – daily fiat deposit limits of $20,000 and monthly ones of $200,000, and daily withdrawal limit of up to $25,000; cryptocurrency limits rise to $50,000 daily and $200,000 monthly. Tier 3 qualification means you need to provide a government-issued ID and verify proof of residence. This means providing a copy of a utility bill no more than three months old, and US citizens need to provide a social security number. Another requirement for Tier 3 verification is uploading an ID-confirmation photo. This one is interesting: an ID-confirmation photo should include you holding the provided ID and a handwritten, signed and dated note that says: ‘Only for trading digital currency on Kraken’. In some countries, such as US, Canada, Germany and Japan, Tier 3 is needed in order to be able to deposit and withdraw fiat currencies. Having a Tier 4 account allows for the highest levels of funding limits available on the platform. 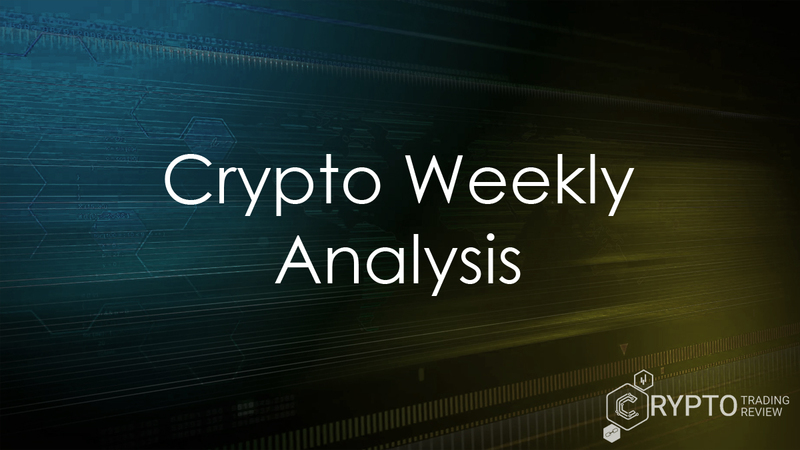 This level is reserved either for corporate entities or individual traders trading at very high volumes, and Kraken provides both accounts with accompanying documentation. 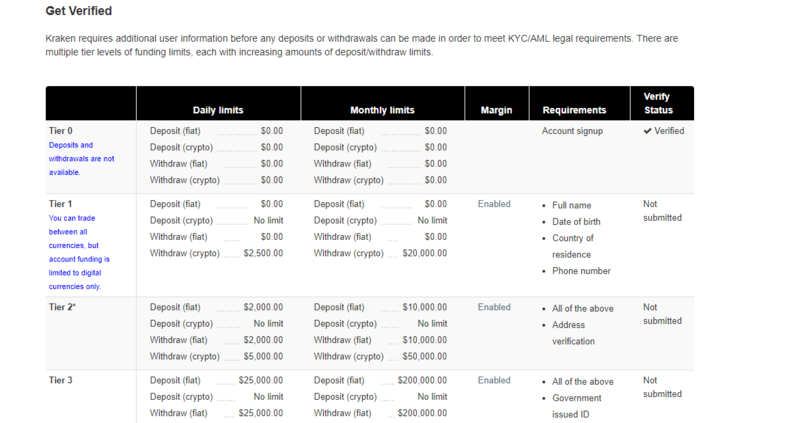 The documentation includes a signed application form and several KYC documents. Tier 4 accounts can deposit daily amounts going up to $100,000 in fiat currency, while the monthly withdrawal limit for both fiat and cryptocurrencies is $500,000. But are there any additional costs? Don’t worry; our Kraken review wouldn’t be complete without that part. As a matter of fact, we analysed that aspect of trading here very carefully. Here are the results. Yes, it’s time for the tricky part, and the one we know you hate and hate researching – the fees. Kraken’s fees are no less confusing than any other, so we will try to summarize them here. Kraken’s fees are charged on a per-trade basis, and Kraken’s trading volumes are calculated for trades made within a period of 30 days. As we’ve already said earlier, the fees depend partly on your account tier – the higher the tier, the lower the fees. Kraken fees are calculated as percentages of trade volumes, with both the buyer and the seller paying. However, in a trade, the buyer pays more than the seller. The fees are also dependant on the currencies – a pair of cryptocurrencies involves lower fees than trading fiat for crypto. Additionally, users are charged 60 dollars per page for paper copies of communications. A note before we continue into detail: Kraken’s webpage provides an in-depth guide to its trading fee structure, so if you need any more information, you’ll surely be able to locate it. Generally, in order to buy less than $50,000 worth of bitcoins a month, you’ll pay about 0.20% per buy. However, if you’re using the ‘Simple’ order form, your fee goes up to 0.26%. You can lower the fee to 0.16% if you learn how to use Kraken’s advanced order types and become something called ‘market maker’. For those of you who are still unfamiliar with the ‘maker vs taker’ terminology, here’s a short explanation. Trading on an exchange is a bit different than your usual forex trading – if you intend to buy an instrument, you have two options, or strategies. The first one is more “aggressive” and involves direct buying by getting the instrument from the lowest ask price (or offer) available. Since this type of entry takes away market liquidity, it is connected to a bigger fee, and we call this a taker fee. In case of Kraken, this is the 0.26% one. The other option or strategy involves placing your own bid in the order book and wait for a trigger by another trader (who intends to sell his assets to you). Logically, this strategy provides liquidity to the market and lets you play a lower fee – a maker fee. 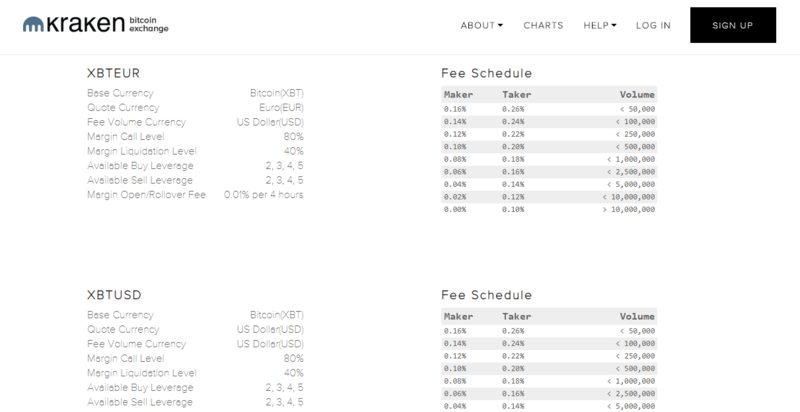 Kraken fees vary depending on the volume. For the main pairs they revolve between 0.1 and 0.35%, but with less common crypto pairs you can get a range from 0.05% to 0.75%. For traders offering liquidity, the fees are non-existent. Regarding withdrawals and deposits, the fees are 0.19% with a $20 minimum, but they depend on the method. For example, there’s a minimum deposit of 5000 Yen which doesn’t include a fee, but 20 Yen in order to withdraw funds. For trading volumes exceeding 50,000, the fees drop all the way to 0,14% and continue to drop depending on the increasing volume. An extreme example would include a maker fee of 0% and taker fee of 0.10% for any trading activity greater than 10,000,000. That’s all well and fine, but let’s try to summarize all that information in a form easier to follow, including precise Kraken fees. First off, we’ll cover the fees related to different methods of fiat currency moving. Like we said, EUR, SEPA and CAD Wire Deposit are free of charge, while JPY Bank deposit is free with a ¥5,000 minimum. EUR SEPA withdrawal includes a €0.09 fee, and both deposits and withdrawal are possible only in EEA countries. EUR Bank Wire deposits are available only outside US and cost €10, while USD Bank Wire deposit and withdrawal fees depend on your location. Only in US, both include a $5 fee, while outside US deposits are $10 and withdrawals up to $60. JPY deposits and withdrawals are possible only in Japan, and the latter includes a ¥20 fee. While CAD Wire deposits are free, EFT Withdrawal includes 10 CAD fee and a 25,000 CAD daily maximum. Since transfers made in digital currencies have unique fees, we’ll list some of those as well. While most deposits are free, Ether (ETH) includes a small transaction fee in order to move it to Kraken’s wallet. Ether withdrawal on Kraken costs Ξ0.005, Tether (USDT) USD₮ 5, Ripple (XRP) Ʀ0.02, Litecoin (LTC) Ł0.02, and Bitcoin (XBT) and Bitcoin Cash (BCH) ฿0.001 and ฿0.001, respectively. So, Kraken fees aren’t that different from other exchanges, but what about leverage? We should also mention that leverage is offered only for some of the instruments and varies from 1:2 to 1:5. Leverage trading comes with a fee varying from 0.01% to 0.02%, based on the specific instrument and applied every four hours. Even though some exchanges’ interfaces can get quite confusing to beginners, this company aimed to make things as simple as possible for first-timers, and even has a ‘Simple’ order form. When it comes to the platform, Kraken relies partly on TradingView (for charting), but provides their own solution for a number of functionalities. The trading platform has an official mobile application, but it’s available only for iOS devices. An Android Kraken app exists as an unofficial version, made by Bitrocket IT. The official Kraken app was released in September 2014 and is a great choice for beginners, since the website’s layout can get confusing for newcomers as its interface is more adept to intermediate and advanced users. So, there it is, everything you need to know about Kraken exchange and a few extras. Instead of a conclusion, we decided to finish this Kraken review with a pros and cons section and a verdict. Since yours is the final verdict that really matters, make sure you read this last part carefully before making your decision. What’s (so) great about Kraken? 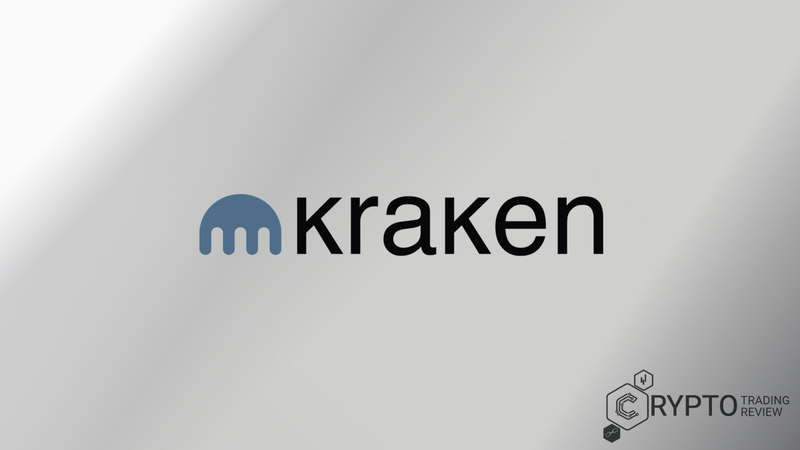 Kraken is a reputable company, with zero hacking attacks in its pretty long history, and it’s a popular choice for both professional cryptocurrency traders and occasional exchange users. With high Bitcoin to EUR liquidity, solid charting by TradingView, and pretty low commissions, these guys are already among top exchanges. However, we couldn’t resist to make a short list of some of its advantages. layers upon layers of security. Kraken exchange is trusted by a large number of institutions, authorities and satisfied traders. An excellent choice for European users, their latest acquisitions seem to indicate a shift in focus towards markets outside Europe, as well. Our Kraken review has shown no issues regarding those most important aspects – but there is always room for improvement. The bottom line is, if you are in search of relatively low fees on a safe exchange (even more so if you are in Europe), go ahead and open an account here right away. You won’t find a better partner.